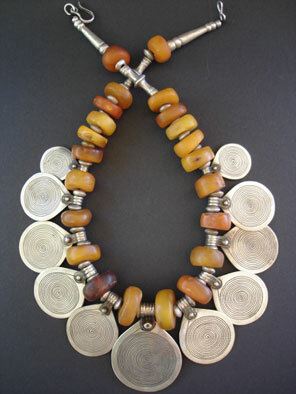 A precious necklace of 11 Berber silver disks with niello spiral design symbolising eternity and genuine antique fossil Amber of beautiful tones and patina with the largest amber bead being 20mm. Lots of old Tuareg silver spacers and end beads with silver hook. A truly exceptional treasure of a necklace!